We are still busy in Bowen Hills. We just leased the office at 10/17 Bowen Bridge Road. The lease was taken up by a professional Building Surveying Company. We had plenty of interest in this unit and we are still looking for space for Eva who wants to establish an accounting practice in th northern suburbs area. She would consider Bowen Hills, Albion, Stafford, Kedron or Chermside. Please contact us if you know anybody with some vacant offices to lease. Bowen Hills is adjacent to Fortitude valley and is a mix of light industrial, commercial and some residential property. Its borders follow Breakfast Creek, Bowen Bridge Road, and parts of Breakfast Creek Road and St Paul’s Terrace. The suburb lies immediately northeast of the Brisbane central business district and is undergoing a residential revival with many new medium density homes to be built in coming years. In 2008 the Bowen Hills Priority Development Area (PDA) was declared, with a review in 2010. 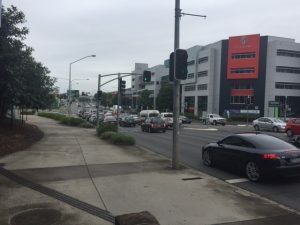 The PDA covers 108-hectares of land in the inner northern suburb of Bowen Hills, and is located east of the Royal Brisbane and Women’s Hospital, south of the inner city bypass and Enoggera Creek and north of Brunswick Street. Landmark places within the PDA include the RNA Showgrounds, the Old Museum, Perry Park and the Bowen Hills Railway Station. The present RNA Showgrounds redevelopment proposal will provide a further catalyst for rejuvenation. A former Metro Property residential development proposal has been replaced by a new proposal for a mixed use retail and office precinct. Located at 66-98 Montpelier Road, Bowen Hills, the development known as ‘Valley Live’ would include 35,474m2 (GFA) of office space and 9,986m2 (GFA) of retail space. QB Commercial have commercial properties for lease in Bowen Hills, including a small shed with exposure to busy Abbotsford Road. Australia’s tallest timber office building has been unveiled in Bowen Hills. It is a staggering 45-metres high. Lendlease officially opened Queensland’s first commercial building this week. It is built almost entirely of timber, and is known as 25 King, Bowen Hills. The ground floor plus nine-storey timber commercial tower is regarded as “the first of its kind for the property market”. The $140 million structure incorporates sustainable building materials such as glue laminated timber structural beams and columns and cross laminated timber floors. Lendlease partnered with funds manager Impact Investment Group to complete the project. Lendlease’s Urban Regeneration Managing Director John Burton says the building demonstrates greener and healthier ways of working. “25 King is setting new benchmarks in environmentally sustainable building practices with strong connections between timber and human health within the built environment,” Burton said. Bates Smart is the design team behind the timber tower in the Brisbane Showgrounds precinct, which Studio Director Basil Director said was the first to be completed for the design firm. The building is targeting a 6-Star Green Star rating, a 5-Star NABERS Energy rating and a WELL Core & Shell rating to complement the precinct’s 6-Star Green Star – Communities rating. Global engineering firm Aurecon occupies 43.5 per cent of the building’s 14,965sq m of net lettable area.